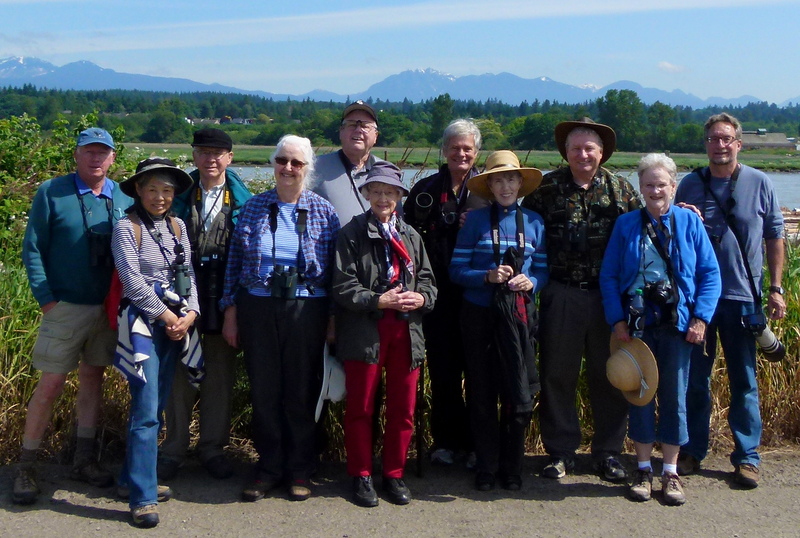 Eleven satisfied birders (Roger M, Hans-Ulf S, Jane Z, Ken & Anne, Marion S, Eleanor C, Mike B, Kay G, Terry C and me) enjoyed a glorious and exciting Wednesday morning at Iona Regional Park and the Sewage Lagoons next door. Lots of hi-lites including: three Teal species (Cinnamon, Blue- and Green-winged), baby Pied-billed Grebes, nesting and possibly nesting Killdeer and Spotted Sandpipers respectively, a Mink, resident Yellow-headed Blackbirds and Purple Martins, lots of pretty flowers and a tasty delicacy to end the outing. 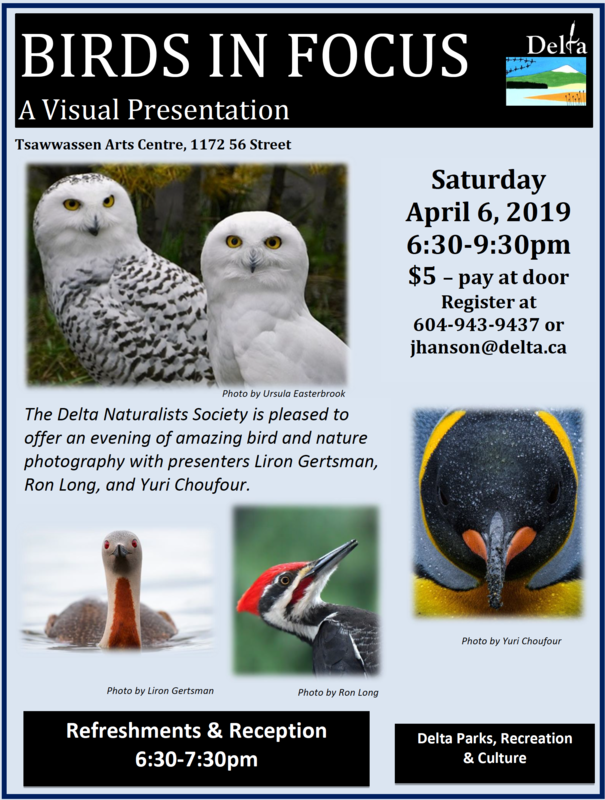 Check out Terry’s, Marion’s (especially the flora) and Ken’s “people” photos on our Picasa site at http://picasaweb.google.com/dncbirding. After a smooth drive from Petra’s using the HOV lanes, we arrived at the Iona Beach parking lot around 8:00 a.m. where Marion was waiting for us (Mike B joined us later from the Victoria ferry). Lots of trucks around hauling huge rocks to support the wall (or pipeline?) along the Fraser (see Ken’s photos). From the boardwalk we saw our first of many Marsh Wrens and Tree, Barn and Violet-green Swallows. Lots of Common Yellowthroat Warblers too. We started our walk between the two ponds and found our first Yellow-headed Blackbirds. A family of Pied-billed Grebes (two babies) thrilled us from our perch on top of a Beaver’s mound. Several Gadwall and Mallard parents and ducklings around too. Singing Black-headed Grosbeaks were in the trees and a few of us finally saw a “fitz-bew” calling Willow Flycatcher. We were blanked on Kingbirds; someone saw an Eastern Kingbird later on Wednesday. We entered the back gate to the Sewage Ponds. Several nesting boxes were being used by Tree Swallows, and we got close-up looks at the three common Swallow species, including Barn and Violet-green. The sewage ponds were unbelievably exciting with so many species including ducks that should be gone from this area by now to their nesting areas inland and north. We saw Northern Pintail, American Wigeon, Northern Shoveler, three Teal species including the not-very-common Blue-winged and a brilliant Cinnamon, and a beaut Canvasback. Several Spotted Sandpipers around and one pair gave us an entertaining dance/mating scene in front of us on the path. We wondered whether/hoped they might be nesting there. 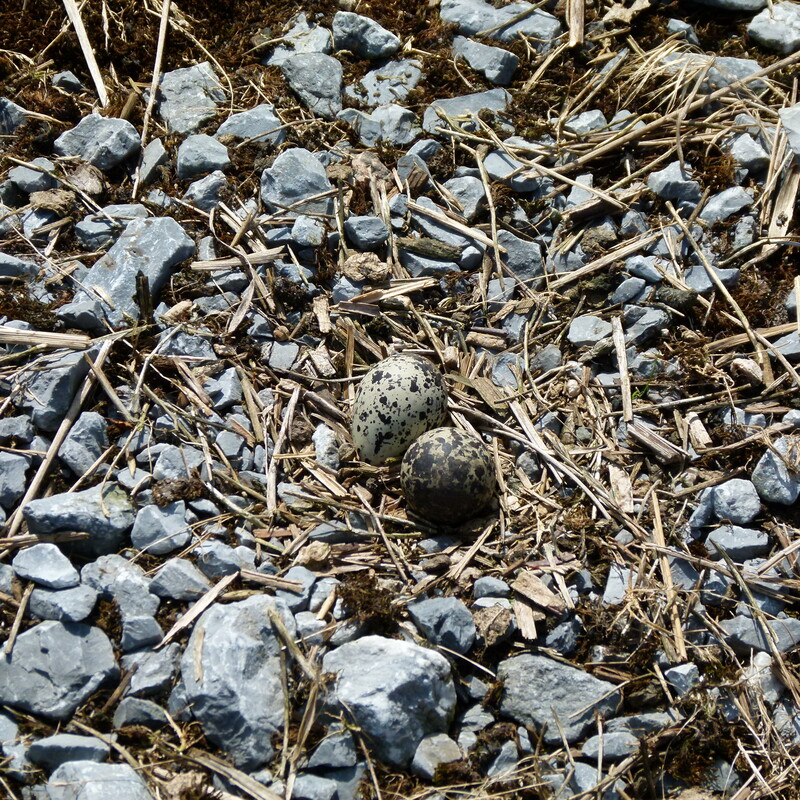 Further along, right on the path, a Killdeer was sitting on two eggs. A Mink surprised us as it scampered along the trail too, but did not get the eggs while we were there. If those eggs reach hatching stage, I will be pleasantly surprised. Roger took the mandatory Group Photo, trying to get the river and snow-capped mountains in the background. Leaving the sewage ponds, we walked the narrow and almost completely over-grown path along the fence toward the Fraser. Warblers (not good with song identification) were calling and we saw some sleek Cedar Waxwings. Roger finally saw one of the noisy Black-headed Grosbeaks. Several pairs of Purple Martins were hanging around their nesting boxes on the pylons in the river. Lots of Starlings and Tree Swallows at the boxes too. A few Caspian Terns gave us fly-pasts, probably from their new colony up river near the casino. Bald eagles were perched on pylons across the river, undisturbed by the occasional Double-crested Cormorant flying by. Rufous Hummingbirds flashed by as well and some heard an American Bittern, but we did not see one, nor any Rails. Several Artists had arrived at Iona and were posted a various spots around the Park, enjoying and painting the beautiful vistas and scenery on this gorgeous first day of Summer. We got back to the parking lot around Noon, where Jane surprised us with two Tupperware containers of fresh Strawberries and a delicious mixture of chocolate-covered nuts and dried red cranberries. We almost forgot about affable PB Lorna who is vacationing in Ontario. Awesome finish to a very enjoyable outing. 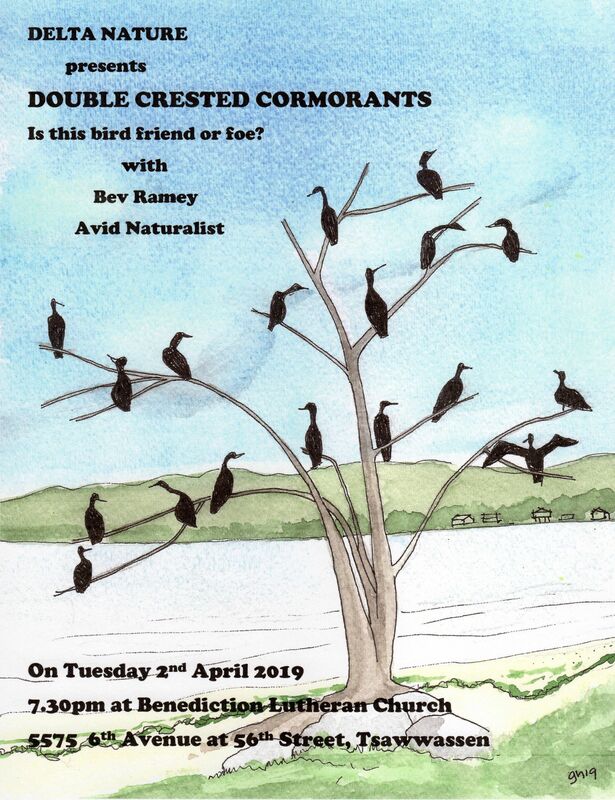 We will meet at Petra’s next Wednesday, June 27, leaving at 7:30 a.m. on an outing probably nearby “around the Bay”. This report is a bit tardy because I am enjoying the long-awaited decent weather here biking with Erica, golfing and gardening. Sandra and I are looking forward to tonight’s annual Delta Nats Garden Party at Pam & Jen’s beautiful backyard Garden. 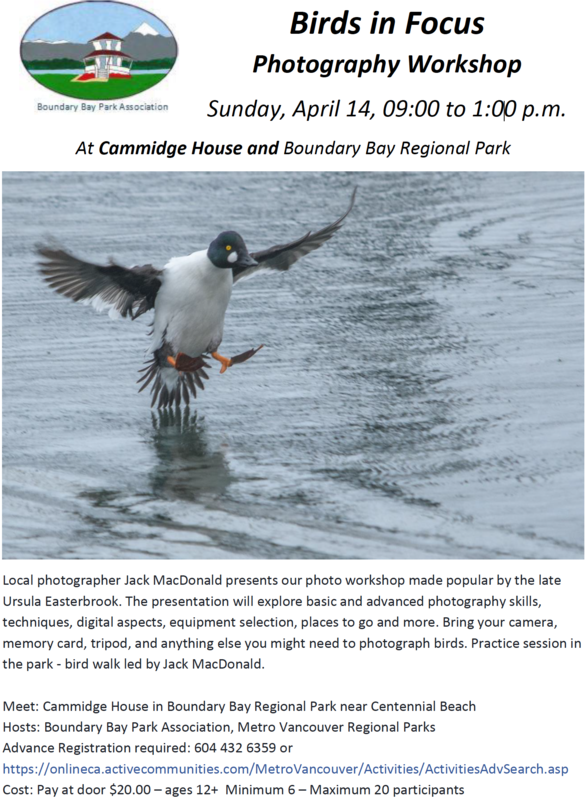 If you have “junk” to sell, the Cammidge House Committee’s bi-monthly Boot Sale is tomorrow (Sat.) morning at Centennial Beach. Comments encouraged, check out our DNCB Blog at www.dncb.wordpress.com and reply to me if you want off this List.